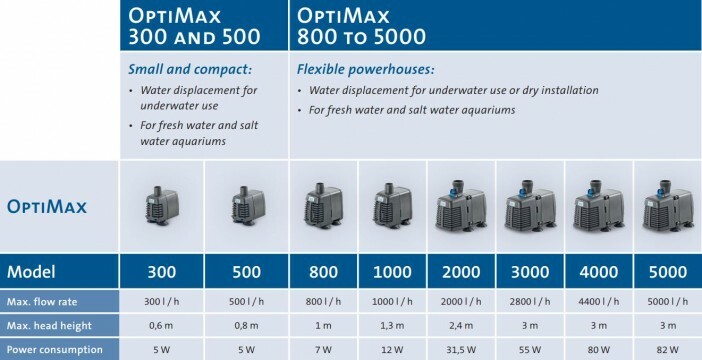 OASE have developed a dedicated range of OptiMax aquarium pumps for use in salt water, fresh water and tropical tanks. From the ultra-compact OptiMax 300 & 500 through to the larger OptiMax 800 - 5000 models which can be both submersed or dry installed. All OptiMax pumps feature an adjustable flow controller to easily regulate the water flow during operation. Ideal for circulating water within the tank or for connection to a suitable internal or externally mounted filter system and/or UV Clarifier such as the OASE ClearTronic. 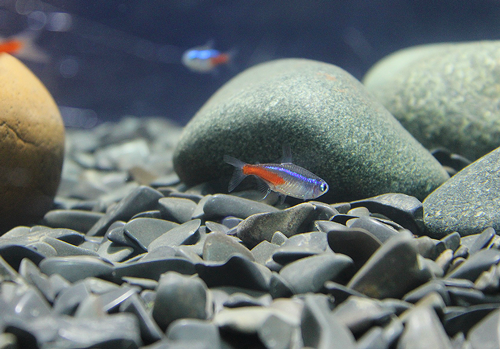 Aquarium Pumps can be used in a variety of applications ranging from adding extra flow, driving custom sump filters, supplying water to aquarium UV Clarifiers and operating protein skimmers. 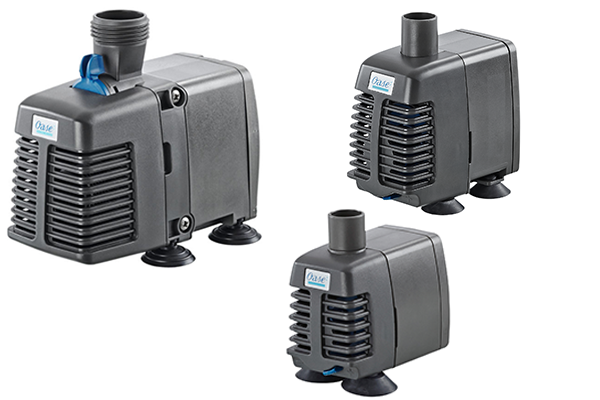 OASE Optimax pumps offer a wide variety of flow and pressure deliveries to suit all indoor aquatic scenarios. Optimax pumps offer competitive pricing and incredibly low power consumption whilst maintaining an extremely high build quality. Everyone knows of OASE for their high-quality durable pond pumps, and they have now transferred that same technology to your home aquarium to provide you with the reliability needed to be assured of a long service life. A 3-year guarantee is provided for added peace of mind! Oase Aquarium Pumps are suited to both fresh and saltwater applications and are designed to be as compact as possible to make installation simple and tidy. The Optimax 800 – 5000 can be dry installed by using the supplied fittings to adapt the inlet and outlet manifolds and all Optimax pump have a variable flow control valve to allow for precise flow rate adjustment. Optimax pumps offer silent running due to the anti-resonance footing. When selecting the right aquarium pump please keep in mind the maximum delivery height and flow rate, as this will determine the overall performance once installed. If any assistance is required to specify the correct model please don’t be afraid to contact us for expert advice!